The show opens in the school hall of St Dithers where the children and staff are singing the school song, rather badly!. Following this the headmistress, Mrs Crabtree, introduces the Ofset chief inspector Ms Grimshaw to deliver the verdict of the schools recent inspection. It isn't good news; the school has been assessed as 'Average'. The school is given six weeks to turn 'Average' into 'Outstanding'. The teachers and pupils all sing a rebellious song, Average, protesting against the Ofset ruling. In the school staffroom the teachers are discussing the Ofset situation and are all very worried about losing their jobs. The headmistress enters to deliver the news that the governors have decided that it is impossible to turn the school around in six weeks and therefore all the staff, and most of the children, will be replaced! 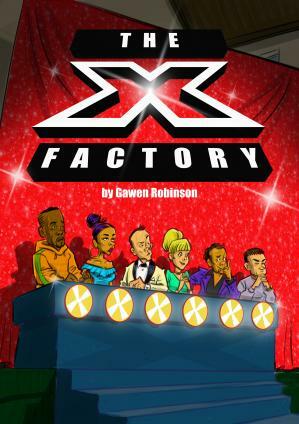 The school will become a school for super stars of the future, an X Factory producing young people to end up on TV talent shows. The scene concludes with the teachers singing a reprise of Average. Set in the schoolyard some of the pupils that were lucky enough to return are discussing the situation they find themselves in. They have to audition in front of a judging panel to assess their talent, or lack of it. Emma and Rachel give a rendition of their offering Rap Pack. The conclusion the pupils come to is that they are all doomed and that all they can do is try their best to impress. The school hall has been re-designed slightly and behind a panel sit the new 'Super Teachers'. Simon Trowel introduces himself and the pupils immediately recognise him from the telly. He introduces the rest of the team: Will.I.Was, Cherri Cola, Dusty Barrel, Bruno Macaroni and Craig Rebel-Cardboard. Simon tells the pupils that over the next few days they will all be working hard with the new teachers who will be looking for those pupils with that extra special talent, The X Factor! At the dance auditions Bant and Beck, the comedic comperes, get things underway. The pupils are paired up to perform in front of Bruno, Craig and Dusty. Bruno performs a Tango for the pupils to copy. The pupil's attempts at this Tango are hilarious! Bruno, Craig and Dusty then assess the pupil's performances. This scene sees Bant and Beck discussing their own vocal abilities leading to introducing the Vocal Auditions. At the dance auditions Bant and Beck introduce Jenny. She is the first, very nervous pupil, to audition. Jenny is actually really keen to be a singer. She sings Blue Skies to which both Cherri and Simon applaud her effort. They tell her she has made it into the Showcase. Bant and Beck then introduce Emma, Rachel and Joe to perform a Rap. The judges think it is awful and send them off. There are no more pupils to audition, as the rest are too terrified to perform! Bant and Beck suggest rehearsing a big chorus number all about being brave and living for the moment - Be Alive. Set in the schoolyard some of the pupils decide to fight back. They need a cunning plan. They realise that although they may not be good at performing arts they do have considerable skills in other areas. They then spot some poor, downtrodden looking people. It's their old teachers! They all decide to work together on the 'cunning plan' to get their school back. It will be a new start - a Brand New Day. In the school hall Wilf, the caretaker and Gladys the cleaner are clearing up following the auditions. They are discussing the good old days and how they used to dance. The Ofsted 'Health and Safety' inspector enters. He is of the opinion that there are many failings in regard to theatrical performances. Wilf and Gladys think his rules regarding a 'fire hazard' are ridiculous. Also the mention of an audience makes the inspector very nervous. He will have to report his findings. Later that night the six rebel students creep in. They have decided to sabotage the sound and lighting systems. Also Emma sets to work on the costumes with a pair of scissors. They all rush off to hide as Simon and the other judges enter. Simon reveals that Ofset have decided to bring the showcase inspection forward to the next day. This causes a bit of panic. However Simon thinks this might play into their hands. After all they are not really teachers and are just looking for talent to increase their own wealth and fame. All this is overheard by the six pupils who now realise that they need help if they are going to be able to keep their school open. The Showcase. The audience are seated and waiting for the show to begin. The judges discover that they have been sabotaged, but they have no choice but to continue. During Showcase Messed Up Track. the performers gallantly try to sing and dance but it is a disaster! The Ofset inspector gets up to leave but the rebels enter and persuade the inspector to stay. The headmistress sticks up for her school, her staff, and her pupils and says that they are not average, they are all amazing! The inspector is willing to listen and all the pupils perform Brand New Day. The performance is amazing and the inspector is impressed enough to agree to keep the school open! Simon and the judges are fired and all the old teachers and pupils are re-instated. A HAPPY ENDING! Well at least till the next Ofset inspection!